As you may or may not know, my favorite hobby is Geocaching. See my geocaching page here or my geocaching profile here. 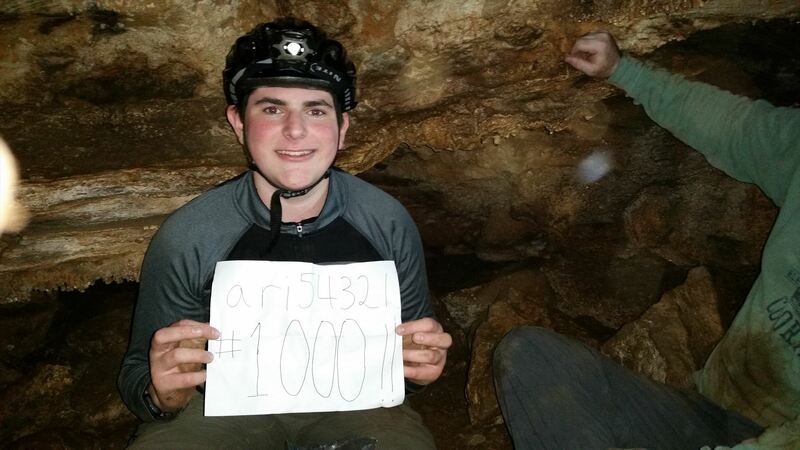 This blog post is about my 1,000th geocache find. 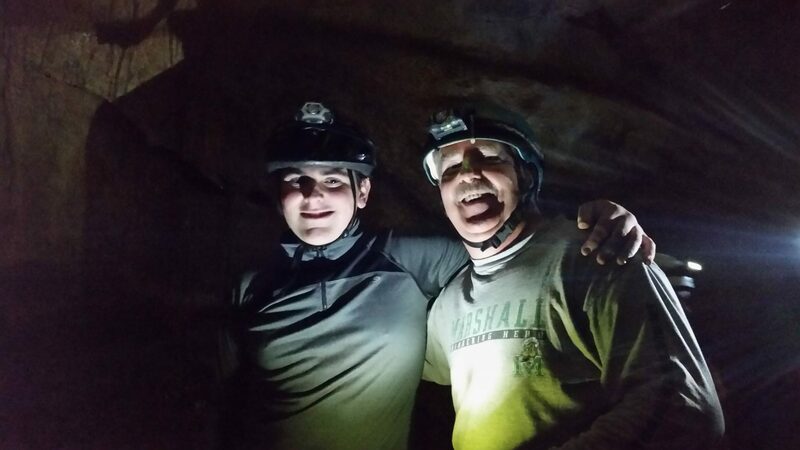 On Saturday, July 16th, 2016, My dad (called “Snerdwing” in the geocaching world; I’m “ari54321”) and I drove out to West Virginia to go spelunking in Whiting’s Neck Cave, where there is a geocache (GC2MD1H). Not outside the cave, but IN the cave. Like, deep into the cave. Not some quick cache. WVTim, the cache owner, says that the speed record for finding it was 20 minutes roundtrip, but most people take way longer than that. 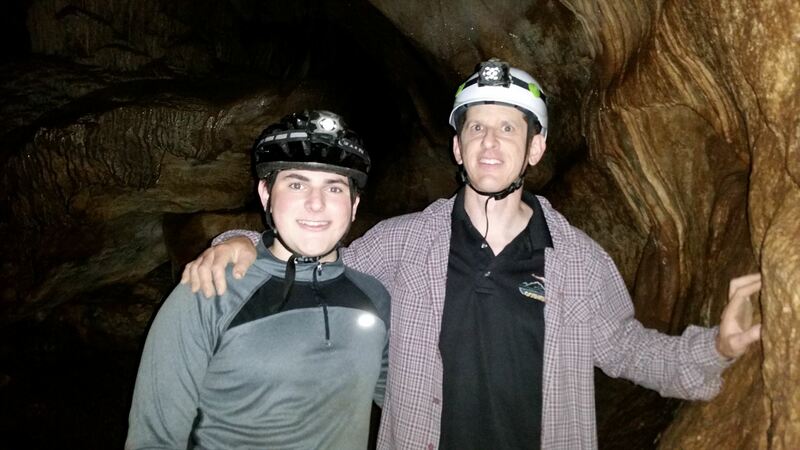 We went with a group of geocachers into the cave, including WVTim himself. He organizes “Let’s go caving” events about yearly in which we spend about a half hour going over caving etiquette, where the cache is within the cave (no GPS reception of course), etc. We attended this year’s event. Afterwards, we drove to the cave. At this point, I’m basically echoing my log on geocaching.com, so I invite you to read it below. 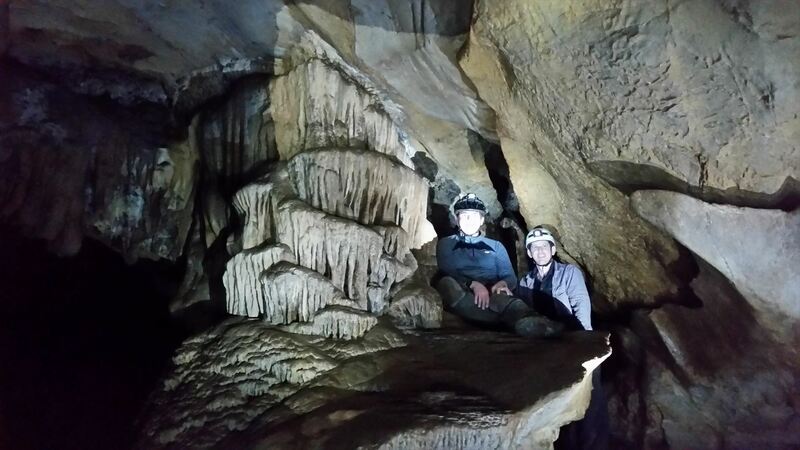 Also, here are the pictures in the cave! 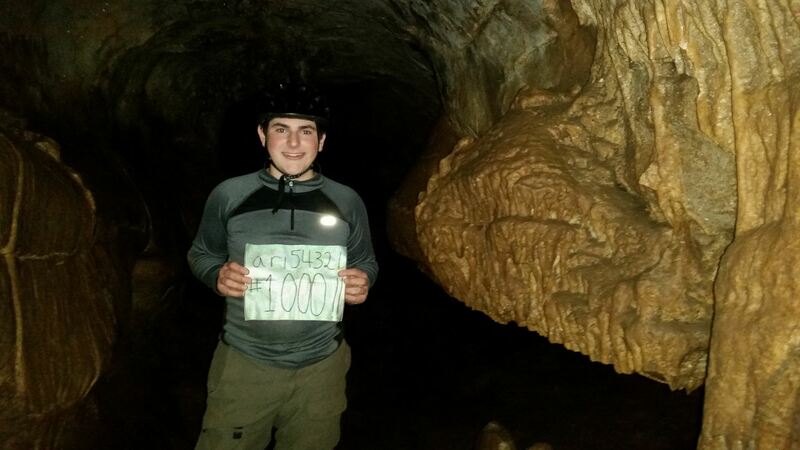 1000th cache at the abyss!! 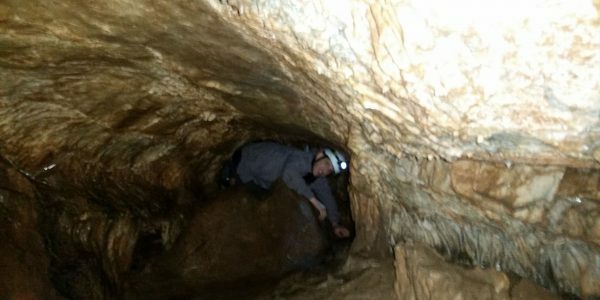 I’ve been wanting to tackle this cache for several years now, and when I found out that WVTim would be hosting another caving event, I knew I had to go. And so we did! I had actually been through Whiting’s Neck Cave two times before. The geocache was there the second time I went, but I didn’t know about it… I was very happy, then, to come back a third time to find this legendary geocache. Snerdwing and I set out for West Virginia in the morning, and made it just a couple minutes past one o’clock to the cave event. The we caravaned with the group to the cave access trailhead. THANK YOU to everyone who shuttled us back and forth! Way more pleasant than walking the whole distance. We made it to the cave and went right in! Down to the first ladder, down the ladder, across the room, up the second ladder. Then through the “chute” which I really loved. I enjoy crawling through tight spaces. Then another fun part – the slide! This is where the slipperiness of the cave becomes fun. We were then in the main room, and Snerdwing and I were one of the first few there. 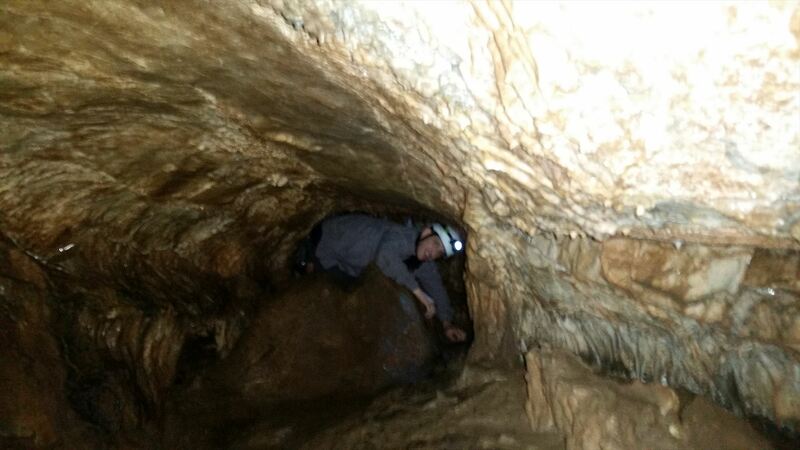 I went into the geocache room and found another geocacher in there looking for the cache. I crawled to the back, and saw a very suspicious looking spot. Sure enough, I reached behind and found the cache! Well, one of them at least. Apparently there was another container in there somewhere, but Snerdwing and I were not able to locate it. 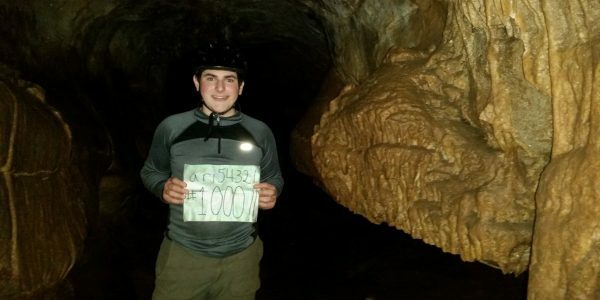 It was found later by the other geocachers. As soon as we were finished taking photos and signing the log there, I replaced it for the next people (who were still coming through the chute) to find. After finding the physical container, Snerdwing and I went up onto the “Interstate” as Tim calls it to the abyss. Interstate of course because it’s flat, smooth and safe. We were the first ones up there because I think the other geocachers weren’t sure it was the safe place Tim had mentioned, so they wanted to wait for him to get to the main room. 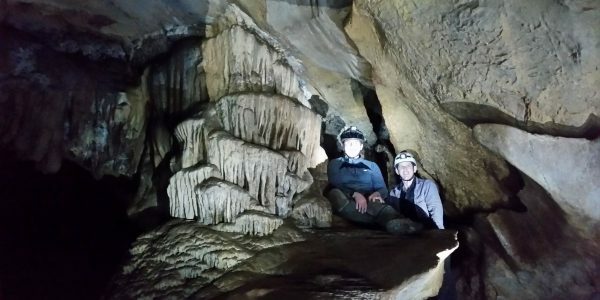 I remembered it from my last times in this cave, so Snerdwing and I went over and got a good look at the abyss and some photos. We returned to the main room, and waited for WVTim to get there (he brought up the rear). Once he arrived, he replaced the two geocaches with one new one, and had us all turn our lights out for a moment of complete darkness. Then, Tim showed some of us the (optional) exit path. A couple of people made it up, but Snerdwing and I decided to pass on it since there was no rope this time. So we went out through the tube, which was once again enjoyable. While we were waiting for people to get through the tube (as it does work as a bottleneck), Snerdwing and I snuck down to the geocache once more to sign the new log. I wanted to really leave my signature behind in that cave. Also, I wanted to make sure I had found the correct cache as Tim had hid it, which I did. After we exited the cave, the “shuttles” were waiting for us at the road! Thank you so much to everyone who helped, and especially Tim and Snurt! 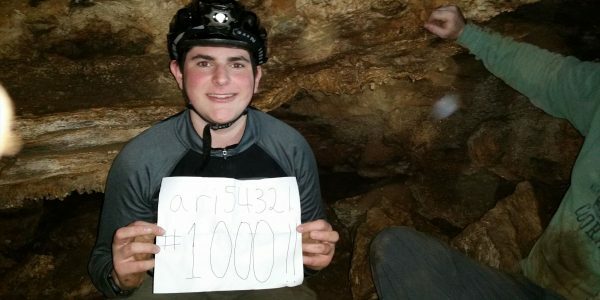 This was an amazing experience never to forget, and an awesome #1000 milestone! TFTC! !